Nutrex Research Outlift Review – Should you use it? It’s quite common to see product stacks made by supplement companies, just like in the case or Nutrex Research’s Outlift Pre-workout supplement. 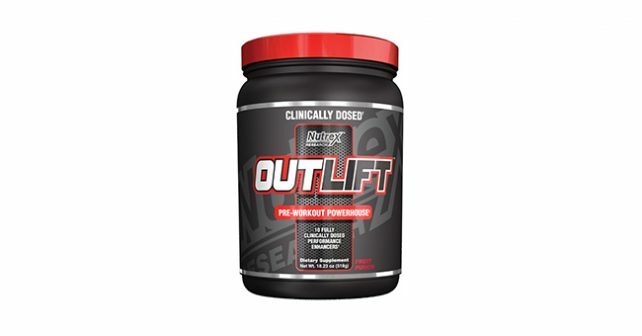 Its supplement profile combines several ingredients that work pre, during, and post-workouts, which suggests that Outlift is specifically formulated to work with the Nutrex Research supplement regimen. Outlift contains ingredients that aren’t usually seen in a pre-workout supplement so its performance as a standalone product is yet to be seen. If you’re taking pre-workout supplements, make sure that you take the time to read through its supplement profile before deciding what you stack it with. Pre-workout supplements commonly have high levels of Caffeine, which can also be present in fat-burning products like thermogenics and metabolic boosters. As a rule of thumb, consuming 300mg of caffeine can result in palpitations even for people who tolerate stimulants well. Who uses Nutrex Research Outlift? Pre-workout supplements like Outlift are used by people who would want to increase their energy, performance, and focus during workouts. For some people, simply drinking coffee is enough to get that simple energy boost, but people who would want to gain an edge take pre-workout supplements. We collected data about Outlift and learned that Outlift contains a mixture of nitric oxide boosters, stimulants, and amino acids. Its primary nitric oxide booster is Citrulline Malate 2:1, which means that there is a 2:1 ratio of citrulline to maleate. Citrulline Malate is much like its more popular component, L-Citrulline, which is a precursor for L-Arginine. The formula of Citrulline Malate 2:1 is currently being studied for its use as an endurance booster during workouts. Outlift also contains several amino acids in Beta Alanine and BCAAs. Beta Alanine, also known as CarnoSyn, is a non-essential amino acid that is a major contributor in reducing muscle fatigue. Beta Alanine boosts carnosine levels in your muscles, which prevent your muscle pH from dropping – the primary contributor to muscle fatigue. BCAAs on the other hand, are amino acids supplied to your muscles in order to prevent muscle catabolism, especially during and after high-intensity training. Outlift contains a little bit of Creatine as well that prevents muscle fatigue and gives you a little more pump during workouts. At 3 grams of pure Creatine Monohydrate, it’s just one gram short of what you need to take every day to make the most out of Creatine. Coupled with these ingredients are Bioperine, N-Acetyl-L-Tyrosine, Taurine, and Caffeine Anhydrous. Be minded of Outlift’s caffeine content of 350mg. At this dose, you can easily experience a caffeine crash, coupled by a tingling effect on your extremities from the effects of Beta Alanine and Caffeine. Like many product offerings from big supplement companies, Nutrex offers stacked savings for Outlift, but you can purchase Outlift for just a little more than a dollar per serving. Outlift is generally well-received by users, but some are complaining about its side effects that include tingling, palpitations, hypertension, and other stimulant-related side effects. Outlift is packed with ingredients. Considering that it has stimulants, energy boosters, BCAAs, and Creatine, it already replaces three other products, and that’s all for a product that costs just more than a dollar per serving. However, the BCAA and Creatine content is just south of your recommended dose, which means that you would need to purchase the other products from Nutrex Research to meet your recommended dose. The best part about Outlift is that you can make the most out of its Nitric Oxide boosters by taking the best supplements for muscle gains like NitroGenix 365. NItroGenix has an effective system that boosts your nitric oxide levels and its components will be further amplified by the Citrulline Malate found in Outlift.